PSP Tutorials by Simone: CHEERS! Tube of choice: I'm using "Bling Bling Birthday" by VeryMany from SATC. Open new image 700 x 700. Copy and paste (element) SkyScraps-R-E41 as a new layer. Duplicate and change blend mode to Multiple. Add Noise, uniform at 90%. Monochrome checked. OK. Copy and paste (paper) SkyScraps-R-PP5 as a new layer, send to bottom and re-size by 90%. Add Mask of choice. I used one of my own, Mask63. Add drop shadow to your glitter layer. C/P element 52 as new layer and re-size by 50% and sharpen. Add drop shadow. Move to right upper hand side of tag. C/P element 5 as new layer. Add drop shadow. Move to right hand side of tag. C/P element 50as new layer. Using your selection tool with a feather of 6, remove the extra like in my screenshot. Add drop shadow. Move to right hand side of tag over Eiffel Tower. C/P element 47 as new layer, move below Eiffel Tower and to the lower right hand side of tag. C/P element 38 as new layer, move in front of Eiffel Tower and to the lower right hand side of tag. Re-size by 50% add drop shadow. In layers palette, activate your glitter layer. C/P element 8 as a new layer and move to the upper left hand side of tag. Add drop shadow. C/P element 34 as a new layer and re-size by 50% and sharpen. Move to the upper right hand side of tag. Add drop shadow. In layers palette, activate your tube layer. C/P element 19 as a new layer and move to the bottom of tag. Add drop shadow. C/P element 36 as a new layer and re-size by 50%. Move to the bottom of tag. Add drop shadow. Bring your cake layer to the top. Now click on your tube layer to activate. C/P element 10as a new layer and free rotate to the right by 90 degrees and move to the bottom of tag. Add drop shadow. Add artist copyright and kit maker name. Go to Edit and copy. Paste as a new animation in Animation Shop. Hold your Ctrl key down and repeatedly hit letter L on your keyboard for a total of 20 frames. 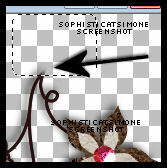 Tutorial written by SophisticatSimone aka Lorraine Halle on Saturday, May 18, 2013.